Establish Puck Possession in the Offensive Zone | Ice Hockey Systems Inc. The blue line is the most strategic area of the ice. Gain the blue line with possession and you can generate scoring chances. If you hold the blue line and force the other team to give up possession you will give up less scoring chances. Here are a couple of ways to attack the blue line and maintain possession in the offensive zone. This play can be very useful when the support is on the strong side of the ice. The puck carrier intentionally draws in the defender that is holding the blue line so they can dump the puck into the space vacated by the defender. The supporting player should be able to pick up the puck at about the top of the circles and maintain possession. This is a great tactic for power play situations against defense that are aggressive at the blue line. Here is a hockey drill for working on strong side soft chips. The first way to maintain puck possession in the offensive zone is by attacking the blue line with speed. In most cases, the defense have not choice but to respect the speed and will end up backing into the zone. In addition to speed, players can use an inside to outside track to keep the defense to the inside of the ice. As the offensive player attacks, they cross over as though they are going to attack through the middle of the ice and then use cross overs to explode to the outside and gain the zone. This forces the defense to not only respect the speed, but also the middle of the ice. Most defense are taught to try and either create a turnover or force a dump by playing tight and holding the blue line. By attacking with speed and using an inside to outside track, it is very difficult for defense to hold the blue line. When it is not possible to attack the blue line with speed then it becomes important to play the puck into space where your teammates have the best chance to get to the loose puck. 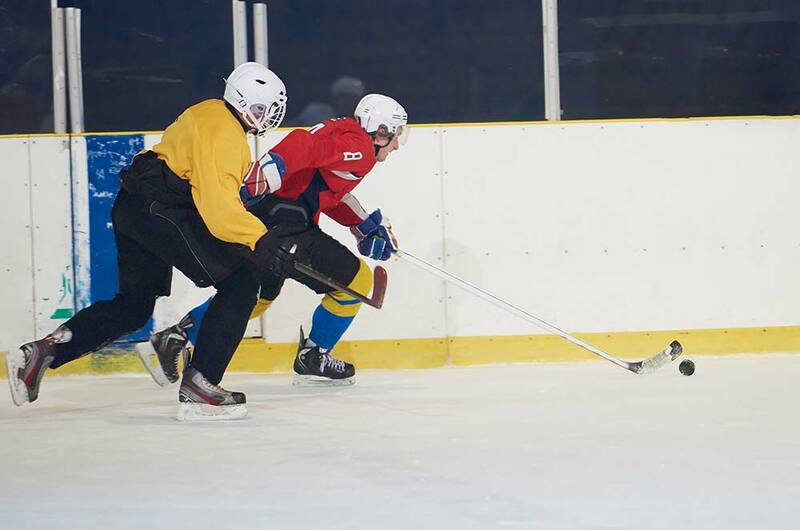 In this scenario the puck carrier is crossing the red line and realizes their teammate is slightly ahead of them with a good amount of speed. Rather than try to gain the blue line and take away their teammates speed, or make a long pass through the neutral zone and risk the turnover, a good play is to dump the puck into the opposite corner. Now their teammate can continue with speed into the zone and most likely win the race to the loose puck. This tactic can be used in the exact same situation. The player crossing the red line realizes they have support on the weak side of the ice with a lot of speed. If the puck is shot in hard enough around the boards then the weak side player should be the first player to the puck. The common denominator in all of these situations is the concept of playing the puck to space where your teammates can skate into the space with speed. Dumping the puck into the zone where the goalie can play the puck or the opposing defense can get to the puck first are less desired. For example, a weak ring around dump in may give the goalie a chance to stop the puck behind the net and make it easier for the defense to get to the puck first and make a play. Increasing the amount of times a team can gain possession off the rush can greatly increase the amount of scoring chances they create.